Halloween is our favorite holiday. Before we had children we had an annual Halloween Costume Party that our friends looked forward to all year. Our couples costumes were always a big hit. Some of the costumes we dressed as were: Adam & Eve, Aphrodite & Cupid, Devil & Angel and Cheerleaders from Saturday Night Live. The year we were the SNL Cheerleaders we did a skit and it is still talked about to this day when we get together with friends. Macy’s first Halloween we dressed up with her. I made Tinker Bell costumes for her and myself and Jake was Captain Hook. Last year when Hudson was born we felt we now had the opportunity to dress as a whole group. Jacob had been dying to be the Mad Hatter from Alice and Wonderland for years before the new Johnny Depp version. 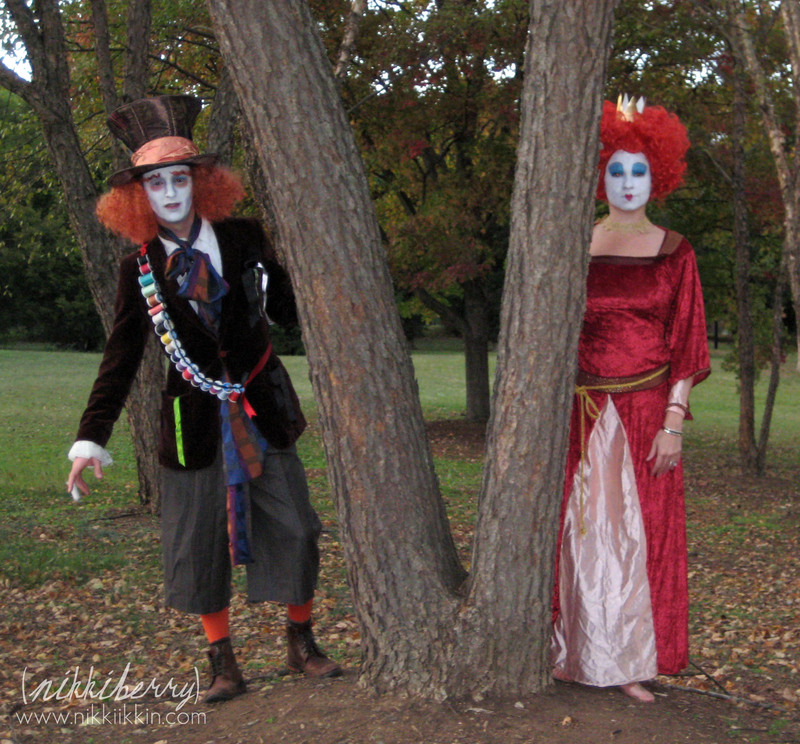 Tim Burton’s creepy take on the Wonderland characters made them even more inspiring as Halloween costumes. And so our Wonderland Family was created! 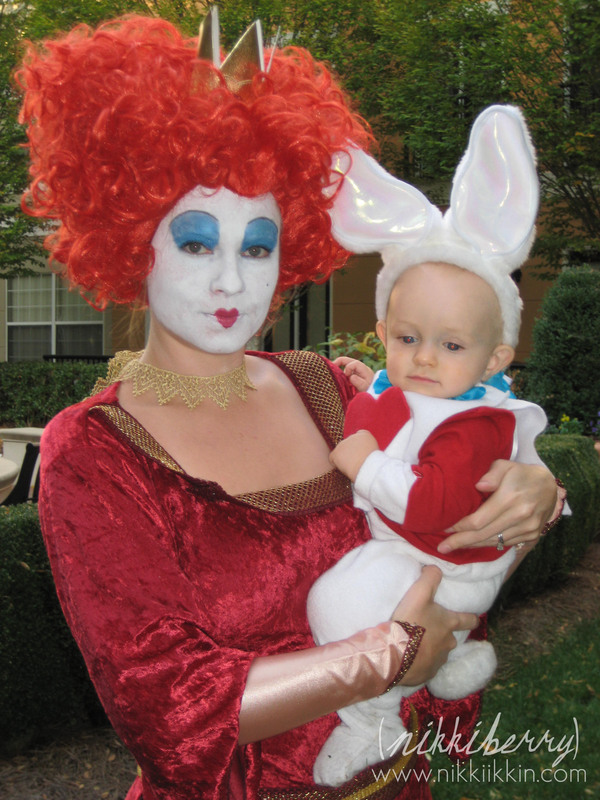 I choose to be the Red Queen from the new movie but Hudson looked cuter as the White Rabbit from the original Disney cartoon version. Did it matter that we mixed the two together? Of course not, we looked awesome together! My bulbous head was the official wig from the new movie but my red dress was just a costume dress. Hudson’s White Rabbit costume was made from white french terry pajamas, a red t-shirt, bunny headband & tail set and I made his collared felt heart….I dont know what that piece is called, a vest? 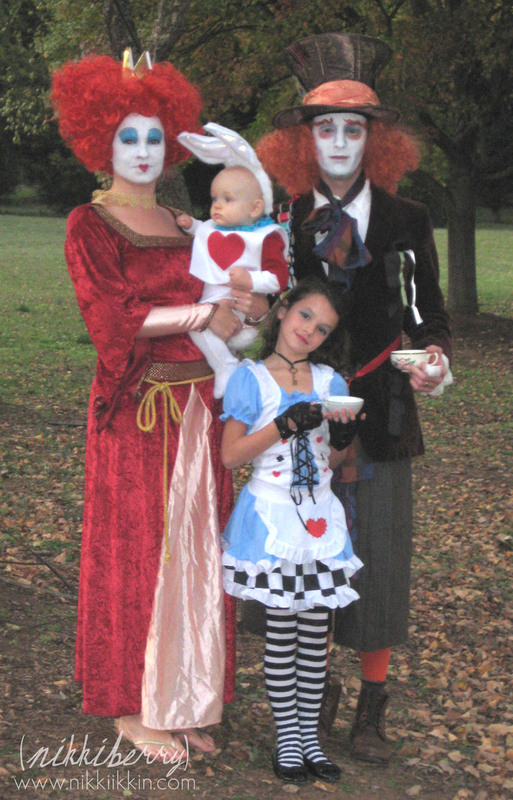 Macy insisted on being Alice (even though I have the blonde hair for it). Grabbing a pre-made costume was the easiest since I had a lot of work to do to pull 4 costumes together and there were very cute ones in the costume stores. She had the idea to add a key on a ribbon for a necklace. Jacob would not do this group dress up unless his costume looked liked he stepped out of the movie. 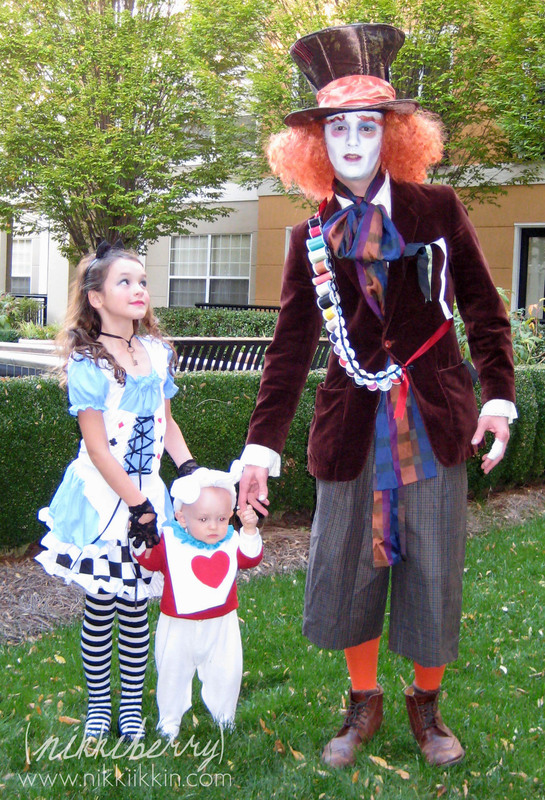 By combining the costume store hat and hair with thrift store clothing finds and a couple of home made items we were able to make his custom so authentic looking people went crazy for him when we went trick or treating! Jake and I both hate to wear face make up for Halloween, its just so uncomfortable but being these characters would not be possible if we didnt. I watched YouTube toutorials to learn how to apply the make up like a professional. 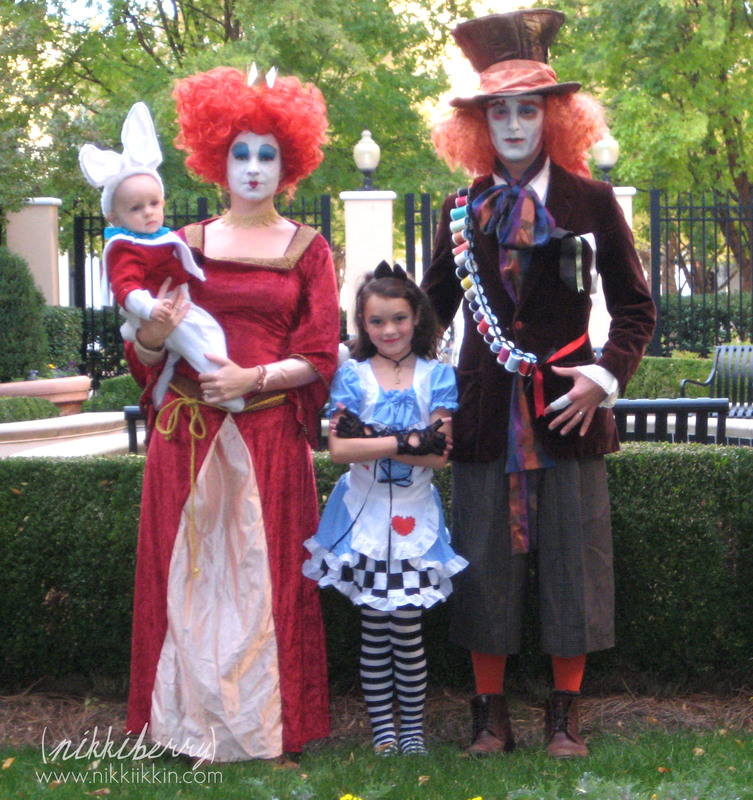 We had so much fun gathering our costumes and going out trick or treating as the Alice and Wonderland family that we all decided that we wanted to dress the same this year. This is a first, we never repeat costumes, but they were too good. We have few changes, Hudson is going to be the Door Mouse and we are adding the White Queen to the group because my MIL is visiting. So look for us in Brooklyn on Halloween and say Hi! And check back after Halloween for an update from this years costumes. where can i get these costumes? Im pretty sure I sum it all up in the text of the post. Hi Danielle, I dont think Hudson’s costume is the that great of shape after a few wears. Its was a mixture of real clothes (a white footed pj & a red t-shirt) and a very inexpensive and easily made vest. I used the cheap felt sheets from Michaels, sewed 2 end to end and then cut a head hole. Then I used a wide blue ribbon, ran a thread through it to ruffle it and then sewed it to the head hole on the felt. Another piece of red felt for the heart was glued on with tacky glue. It probably cost less than $2 to make the vest, its worth a try!